Copalinga is a high-end ecolodge located within the buffer zone of the Podocarpus National Park, just ten minutes away from the city of Zamora in Southern Ecuador. Copalinga Ecolodge is a great place to stay at for many reasons. First, it is run by its owners, Catherine and Baldwin, who are both great hosts and great cooks. Copalinga is a great place for birdwatchers and in fact, it was built having in mind the needs of this important segment of travelers. Through its 9 Km of trails, guests can easily access the upper montane tropical forest that surrounds Copalinga and see Inca jays, nightjars, a lot of colorful tanagers and many different types of hummingbirds. Copalinga's wood work and decoration are great and the cabins are separate from one another, which gives guests a lot of privacy. 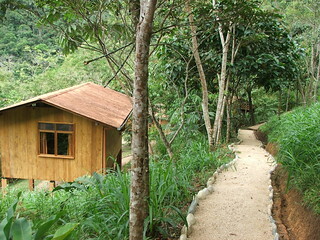 More importantly, all cabins have a private bathroom (except student cabins), hot water and a balcony. Copalinga is also a great place to stay because of its proximity (~ 3 Km) to the Podocarpus National Park (Bombuscaro area entrance), which is the most important conservation area of Southern Ecuador and was recently declared a UNESCO World Biosphere Reserve. Moreover, Copalinga has bird feeders (nectar for hummingbirds and bananas for tanagers) installed right in front of its dining tables. This allows guests to enjoy great food while observing beautiful birds. Further, guests can learn about the flora of the area by exploring Copalinga's orchid garden, which has more than 150 native species. Please note that due to limited space, reservations must be made at least 3 days before the first night of stay. Green initiatives Copalinga has its own clean & renewable power source, a hidroelectrical turbine. Also, sewage water is treated in-situ. Moreover, Copalinga carries out reforestation with native plants and environmental education (specially bird conservation education). Garbage is classified and recycled as much as possible.